Interest in nonnatural peptide drugs has waxed and waned over the past 30 years. The science has been fascinating, but delivery and pharmacokinetic issues remain. During the 1990s, Affymax popularized libraries of short peptides immobilized on inert substrates, but these peptides never led to novel therapeutic molecules or strategies. Now, Bicycle Therapeutics has taken up the “peptide challenge” by rolling out an improved peptide expression platform. The company was launched in 2009 to follow up discoveries made by Gregory Winter, Ph.D., who was then deputy director of the MRC Centre for Protein Engineering. Since then, Dr. Winter, as cofounder and director of Bicycle Therapeutics, has participated in the development of structures that offer an intriguing combination of chemical diversity, compactness, and specificity for significant drug targets. Bacteriophage display is known for creating immense chemical diversity, with each virus expressing a unique peptide sequence that is capable of being crosslinked in situ. Phage assemblies showing affinity for molecular targets undergo affinity-based selection analogous to a typical mAb discovery program. Synthesizing and screening even tiny subsets of phage-displayed peptide libraries—Bicycle’s contain many billions of unique structures—would take forever using manual methods. Bicycle peptides that bind are further optimized through affinity maturation. The process involves identifying amino acids responsible for target binding and creating sublibraries containing various combinations and sequences of those residues. Bicycle gets down to subnanomolar binding affinities rapidly, with antibody-like strength and selectivity. This kind of binding sometimes occurs right off the bat, but even when it doesn’t, scientists are able to develop useful structure-activity relationships from the binding data. When advantageous, unnatural amino acids can be swapped into the bicyclic peptides. “We joke that bacteriophages are the hardest working chemists on earth. We don’t pay them much, and they work overnight without grumbling,” Dr. Keen jokes. After expression and crosslinking, the structures are in the 1.5 kDa molecular weight range. That is larger than a typical small-molecule nonpeptide drug, but given the geometric constraints, these structures do, in fact, behave in vivo like classical pharmaceuticals. Doses are in the milligram range, for example, but Dr. Keen notes that the dose depends on the pharmacokinetics and distribution. Bicycles penetrate tumors much more easily than much larger antibodies and have systemic half-lives of minutes to a few hours. These characteristics are useful for drugs requiring a high concentration within diseased tissue and low systemic toxicity. Bicycle Therapeutics develops bicyclic peptides that provide antibody-like target specificity and high affinity. The company can generates phage display libraries comprising more than 1015 unique bicyclic peptides. 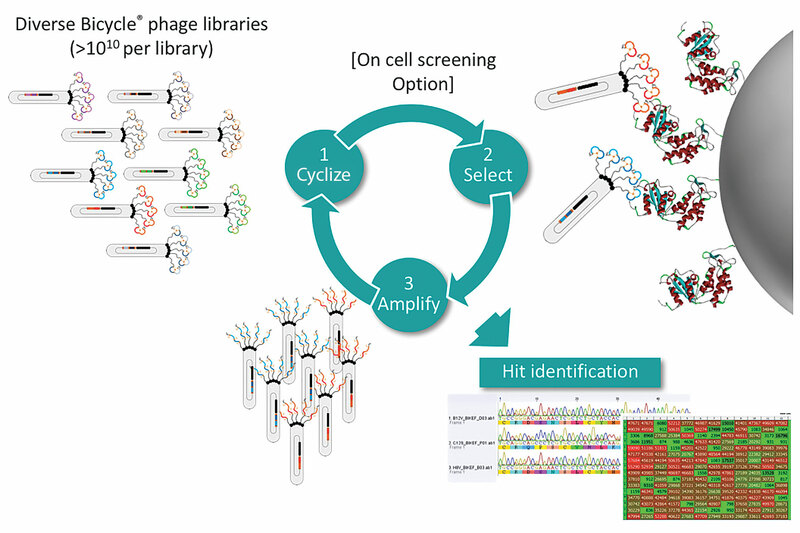 To screen the peptides, the company uses multiple iterative rounds of phage selection combined with identification of bicyclic peptides using sequencing and a parallel functional assay to determine binding and affinity. Much innovation in peptide half-life extension has occurred by way of structural modifications of glucagon-like peptide 1 (GLP-1) products, which typically are used to treat type 2 diabetes. The natural hormone GLP-1 is released by the intestine to stimulate insulin release in response to food consumption. Type 2 diabetics respond well to GLP-1, but because the molecule’s plasma half-life is about two minutes, chemical modifications to improve the molecule’s pharmacokinetics have been a top priority for drug manufacturers. Novo Nordisk has been working with acylated peptides for two decades. Its first success in this category was acylated insulin, which enabled once-daily dosing and opened the door to chemical modification and half-life extension of peptides. Subsequently, GLP-1 emerged as a potential diabetes treatment as exenatide, an acylated product with a half-life of less than two hours. Novo further improved on this idea by developing two additional GLP-1 analogues: liraglutide, which incorporates an altered half-life-mediating sidechain, and semaglutide, which provides improved albumin binding. Both liraglutide, which permits once-daily dosing, and semaglutide, which provides basal insulin release for an entire week, are dosed in the 1–2 mg range. “It took some interesting medicinal chemistry to modify the GLP-1 molecule into those products,” says Christopher Rhodes, Ph.D., CEO of Drug Delivery Experts, who was not involved in Novo’s reasearch on GLP-1. Acendis, a German company, and U.S.-based Prolynx take a different approach to half-life extension. These companies have developed peptide prodrugs that differ chemically but share the characteristic of undergoing cleavage under physiologic conditions at a steady, predictable rate. Acendis’ TransCon delivery platform has been applied to parathyroid hormone, human growth hormone, C-type natriuretic peptide, and ranibizumab (for treating macular edema). Several TransCon peptides for treating diabetes are in preclinical studies conducted by Sanofi. Similarly, Prolynx has developed self-cleavable linkers that undergo beta-elimination to release native peptides either to general circulation or to macromolecular carriers such as polyethylene glycol or hydrogels. The carriers retain the drug within the subcutaneous injection space, where the drug is released under controlled kinetics. To prolong the circulating half-lives of proteins, peptides, and small-molecule drugs, Amunix deploys a technology that emulates PEGylation. Amunix’ XTEN platform uses a soluble, chemically defined protein polymer and a recombinant fusion approach to create peptide-XTEN fusion molecules directly through conventional protein expression and without subsequent chemical modification. Drug Delivery Experts is a drug product development firm that specializes in the integration of complex formulations, delivery systems, and device technologies. With respect to peptide therapeutics, the firm works to combine sustained release (via formulation approaches) and sustained exposure (via conjugate approaches). 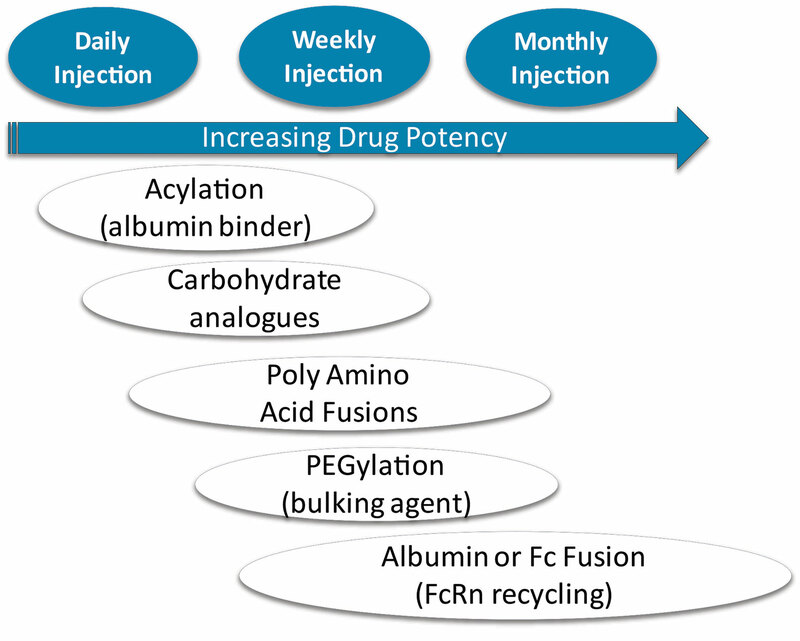 As this image indicates, many conjugate approaches are available to developers interested in extending the half-lives of peptide drugs. 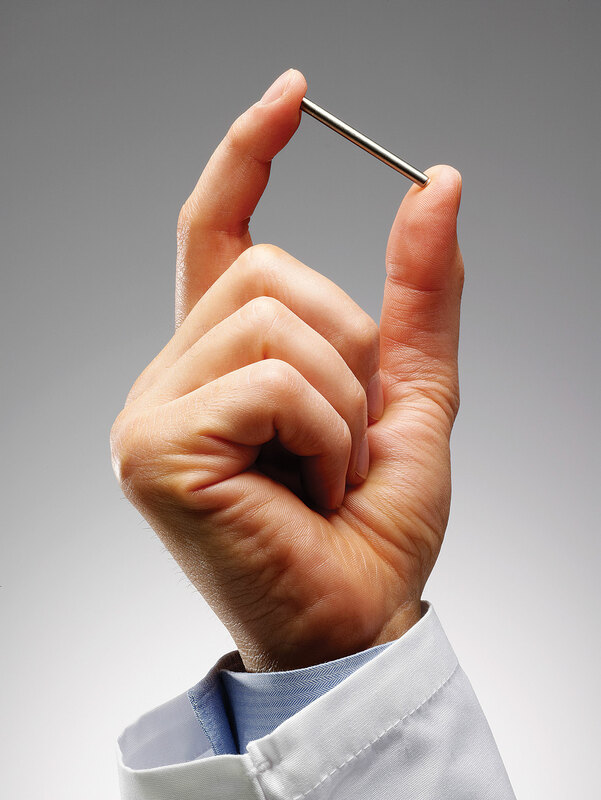 Intarcia Therapeutic’s Medici Drug Delivery System™ is a subdermal system comprising a matchstick-sized osmotic minipump, a formulation that stabilizes peptide drugs for at least one year, and a pump placement and removal tool. Once the pump is in place, extracellular fluid diffuses into the pump at one end through a semipermeable membrane. Then the fluid enters the osmotic engine, which expands to drive a piston at a controlled rate, forcing the drug out steadily and consistently through the other end of the device. The Medici pump holds enough drug to treat the patient for up to one year. Paul Feldman, Ph.D., who heads discovery and translational medicine at Intarcia, notes that the Medici pump is a versatile delivery platform: “It’s suitable for many drug types, including peptides, antibody fragments, and even small molecules.” The limitations are drug potency and, to a lesser extent, solubility. Because the Medici pump is small, it can hold only a specified amount of drug. 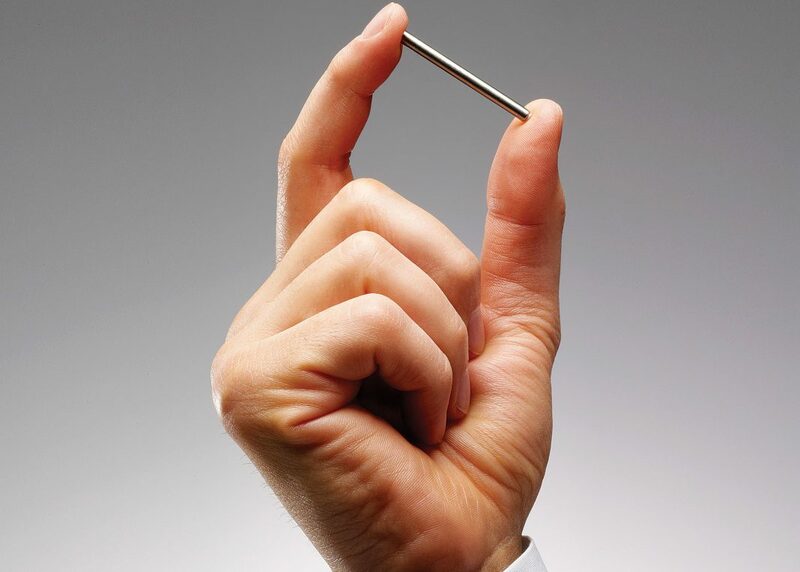 Intarcia’s lead investigational asset to treat type 2 diabetes, ITCA650, is a product candidate that combines the Medici pump and the peptide exenatide. ITCA650, which is undergoing NDA review, delivers up to 60 mg of exenatide per day for a period of six months. Intarcia anticipates that its platform could be used to deliver other drugs besides exenatide. If a drug is to be delivered via the Medici pump, however, it not only needs to maintain accurate potency, it must also solubilize sufficiently in Intarcia’s storage matrix. Even with those constraints, many drugs in many different categories qualify for use with a Medici pump. In addition to having expertise in peptide discovery and delivery, Intarcia has a collaboration in place with the Swiss biotech company NuMab for the discovery of potent antibody fragments for treating metabolic and immunoinflammation disorders. More recently, Intarcia has teamed with the Gates Foundation on an HIV prevention regimen involving a small-molecule drug. The company is also participating in a peptide program with California Institute for Biomedical Research. The Medici Drug Delivery System is a matchstick-sized osmotic minipump that is placed just under the dermal layer of the skin to deliver a continuous and consistent flow of medication. This system, which was developed by Intarcia Therapeutics, allows for proteins, peptides, antibody fragments, and other highly potent small molecules to be stabilized at or above human body temperatures for three years or longer. Contract manufacturing is at least as significant for peptide manufacturing as it is for small-molecule drugs and biologics. With the renewed interest in peptide drugs, solid-phase peptide synthesis has become a specialty capability for contractors who typically run multiproduct facilities. With that competency comes the potential for product cross-contamination; contamination is of particular concern given the potency of some peptide drugs. High solubility presents cleaning and cleaning validation functions with fewer problems. Processes that permit easy cleaning can speed up changeovers, provided appropriate analytical methodology exists to verify the appropriate cleanliness level. Chemical definition, which exists to a far lesser degree with mAb, is another factor in favor of peptide processing. Whereas antibodies are expressed in living organisms—which confer a multitude of post-translational modifications—peptides are synthesized. With peptides, input equals output. Since every synthesis step and building block is known, maintaining a library of known and potential side products and contaminants is much easier for peptides than for proteins. “There are many more unknowns with mAbs,” Dr. Geiger notes. Optical purity is a factor that mAb manufacturers hardly think about, but this can affect peptide manufacturing. AmbioPharm purchases its peptide building blocks as protected, synthetically generated amino acids. Unlike nature, which synthesizes protein-based cell culture media and feed components perfectly, chemical asymmetric synthesis always creates some small percentage of the wrong mirror-image stereoisomer. Keeping the concentration of stereoisomers as low as possible assures optical purity and product quality. Analytics is crucial for determining optical purity as well. “Older reverse-phase HPLC methods might not distinguish between the correct entity, a product or starting material, and another, isomeric entity that possesses one or more ‘reverse’ chiral centers,” warns Dr. Geiger. “This is one area where you can’t cut corners.” He adds that the optical purity of starting materials is not so much an issue as is reliable supply.